Alicante's coast is 212 Km long. Shaping a wide curve from the sea to El Cabo de la Nao, continuing to the north all the way to Denia. Two beaches in Alicante I definitely recommend visiting are Playa San Juan and Playa El Saladar. Fine and soft sand running through your toes while walking through Playa San Juan is a relaxing experiencing, and it also offers a number of sports and fun attractions for children and adults, and the best part is that is located in the hub where restaurants, bars, pubs, discos, cafés, hotels and shopping centers are situated for your convenience. This is a picture of Playa San Juan while a beautiful sunset in Alicante. Now, Playa El Saladar is a more quite spot. Apparently is not very known so you can enjoy the sun and the sea, away from noise and crowds. This beach is also referred to as Urbanova. Check out the image of this beauty in Alicante. 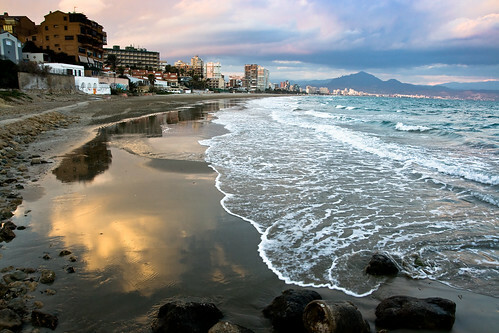 A cheap car hire in Alicante allows to drive to beaches in Alicante and draw your own paths during your visit.